Nothing new in my bakes. They are just repeated bakes that I made over the past few days. House visiting was enough to tire me out. All the eating and gorging were just so sinful. There was so much tim sum food to take, so much CNY goodies to indulge. After eating them, it was time to hit the sports stadium! I had been putting on (lots of) weight for the past few months. Didn't have enough discipline (to exercise regularly) and control (to indulge). Until one day, I just couldn't fit into my clothings anymore!! ARRGGHH... time to exercise!! Made a chocolate fudge cake for a colleague. 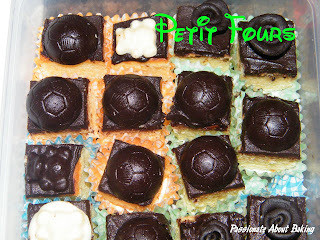 Make some mini cakes, alias Petit Fours, and brought them to a friend's house for a house visit. Bake a banana & black sesame chiffon cake as a birthday cake for my brother-in-law since he requested for a chiffon. This year, dad decided to buy a cake for mum instead of me baking. I think he wanted to have a taste of a real nice cake. I concluded that the cakes I baked all this time were not within his standard, thus, he still prefer to buy! 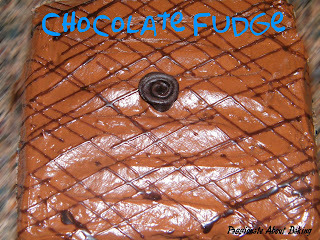 :p Well, it's good to buy from outside once a while, that'll save me the trouble of baking. He got the Chocolate Walnut Cake from Secret Recipe. I love the cake too! 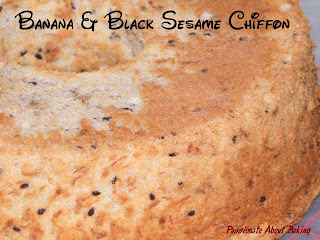 Banana and black sesame chiffon is something new! Your cakes always look fantastic.